I went shopping again this weekend and saw a lot clothes and accessories with tassels. There were quite a few tassel earrings that I saw especially at Forever 21. After a small incident, I never wore Forever21 earrings again. 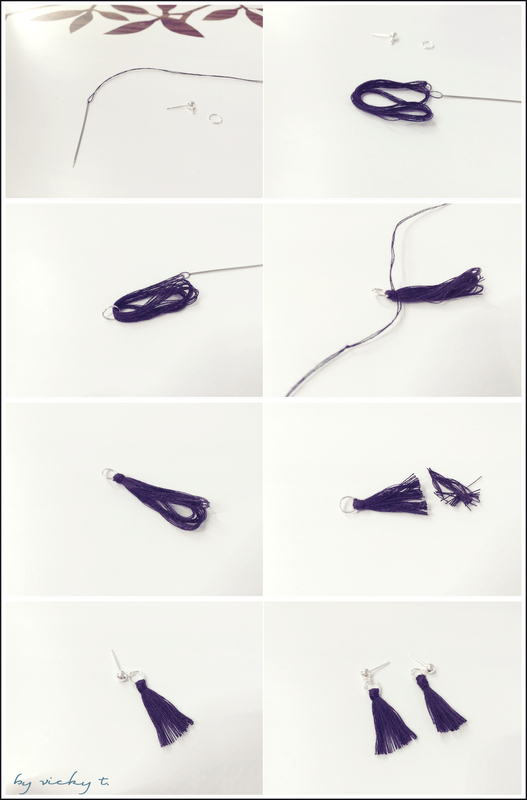 It doesn’t look too difficult to make so I tried to make my own DIY tassel earrings. I first started threading the needle with a long piece of black thread and left the ends un-knotted. Fold in half and then half again until the desired length. Then, I hooped in the jump ring and cut out the needle. I put another thread through the needle and ended it with a knot. I proceeded to loop it around the top near the jump ring and tied it with a dead knot. Now I just need to cut off the ends and attach it to the earrings. Repeat and I have a pair of tassel earrings. I am loving the tassel trend, thanks for sharing this great DIY. Thank you for reading. Glad you liked it! I love the way fringes sway !